Most visitors who want to go to Raja Ampat islands usually fly to Sorong city first. It is the city where they can take a rest for one day to buy food and other supplies before continuing their trip to Raja Ampat - the most beautiful destination in the world for marine tourism. After traveling in the islands for a few days or a week, they will go back to Sorong again to wait for their return flight. There are a lot of tourists who are interested in taking land tour in Sorong city but do not know how. For that purpose, I introduce Klasow valley - a recommended destination for Rainforest, Wildlife and Birdwatching Tour. 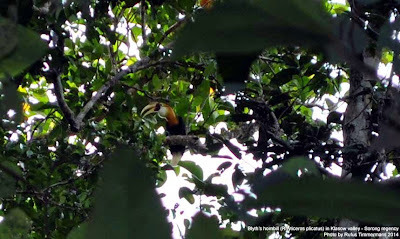 There is a birding site in Sorong regency of West Papua. Its name is Klasow valley. Birdwatchers who want to go there must rent a 4WD pick-up truck such as Toyota Hilux G series, Mitsubishi Triton or Ford Ranger from Sorong city. It is a 2-hour ride from the city. Lowland tropical vegetation covers the valley. Most of the valley is flat land with a mountain range in the north bordering the valley with the coastal area. The best birding time is in the mornings and in the afternoons before sunset. Wear trekking boots or water shoes before you start walking to explore the branches and twigs of the trees in search of birds of New Guine. Make sure that you bring a pair of binoculars, a D-SLR camera with super telephoto lens or a bridge camera such as Nikon Coolpix P900. To enhance your birding experience, I will bring a spotting scope and field guide "Birds of New Guinea" written by Bruce Beehler and his friends. Sulphur Crested Cockatoo, Moustached Tree Swift, Blyth's hornbill, Pink-spotted Fruit Dove, Western Crowned Pigeon, Yellow-billed Kingfisher, Dwarf Kingfisher, Rufous-bellied Kookaburra, and Pinon Imperial Pigeon, are some of the numerous species of birds which you could watch in Klasow valley of Sorong regency. I will meet you in Sorong city. We will need to buy food in traditional market and other supplies. When everything is ready, we go to Klasow valley by a 4WD car. It takes around 1 hour to reach the valley. When the car stops, we need to continue walking through the jungle for another 1 hour to reach our base camp. We can start watching birds that afternoon in the clearing . Usually Dollarbird (Eurystomus orientalis), Yellow-faced Myna (Mino dumontii) or Golden myna (Mino anais), Large Fig Parrot (Psittaculirostris desmarestii) can be seen perching on the surrounding trees near our traditional hut. Wake up early in the morning at around 4.30 to walk through dense forest to reach the site near Klasow river where we will watch Lesser Birds of Paradise (Paradisaea minora). Before leaving our hut, please make sure that you drink some tea or coffee and have some biscuits. The birds are active in the mornings and in the afternoons. It takes approximately 1 hour of walking up and down 2 steep hills to reach the birding site. Male paradise birds call their female birds and dance to seduce them by displaying their beautiful feather. After watching the birds, we can walk back to our base. Along the way, we may see Friarbird, Rainbow Lorikeet, or Spangled Drongo, In the afternoon, we can have another walking tour in the jungle to watch birds, and see unique vines, various palm and pandanus plants, and butterflies that thrive in the jungle. There are a lot of herbs in the forest that are used by Papuan people to cure their disease including malaria. We can have another walk to see Sago trees whose lith are processed by indigenous Papuan people to extract is flour. Men usually cut the matured tree and women do the grating. They will squeeze the grated lith using water from the nearby river. We can also visit a river in Klasow valley to enjoy swimming or watching birds. Pinon imperial pigeon (Ducula pinon), Western Crowned Pigeon (Goura cristata) usually can be spotted along the banks of the river. After saying good bye to the local villagers, we will walk back slowly to come out of the jungle where we will transfer you back to Sorong city. After that, fly to Sorong city. There are several airlines that regularly serve this Jakarta - Sorong route. They are Garuda Indonesia Airways, Sriwijaya Air, Express Air and Lion/ Wings Air. Your plane will land on Domine Eduard Osok (DEO) airport. Please, contact me (Charles Roring) by sending e-mail to: peace4wp@gmail.com or call 006281332245180. 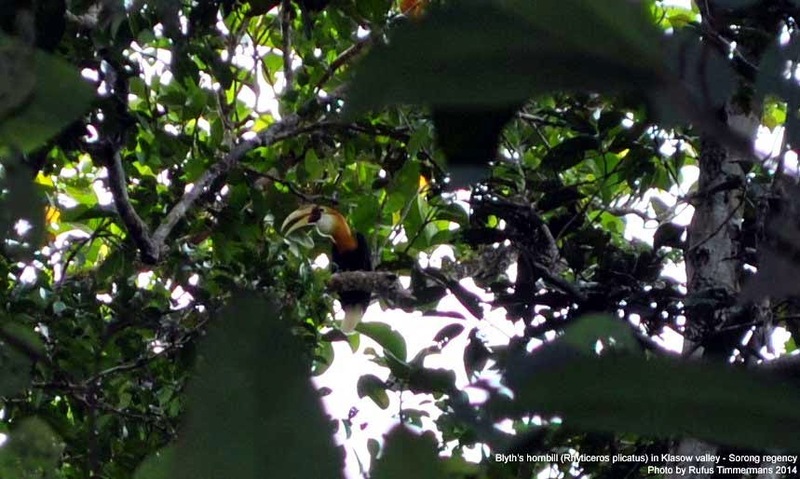 I will prepare the logistics, transport vehicle and contact local villagers for your birdwatching trip in Klasow valley or any other rainforest areas in Tambrauw mountains. In addition to birds, visitors could also see other wild animals such as cuscus, deer, casowary bird, wild pigs, snake, porcupine and wallaby. A lot of insects can be found in the forest including birdwing butterfly Ornitopthera Priamus. You need to bring a small bottle of anti insect repellent lotion to protect your skin from being bitten by mosquito, ants and very tiny insect that is locally called 'agas.' You must apply it all over your skin. As of today, tropical rainforests that cover most part of Klasow valley and many other parts in West Papua are being threatened by logging activities. To stop them some local villagers take the initiative of introducing eco-tourism as an alternative income generation for local people. We expect visitors to be more tolerant to the lack of experience and profesionalism among the local villagers during the birding tour. From the positive perspective, we really hope that eco-tourism can help villagers stop selling their forests to loggers. If you need my service in working as interpreter, and in arranging your trip to Klasow valley of Sorong regency, please contact me (Charles Roring) by E-mail: peace4wp@gmail.com.